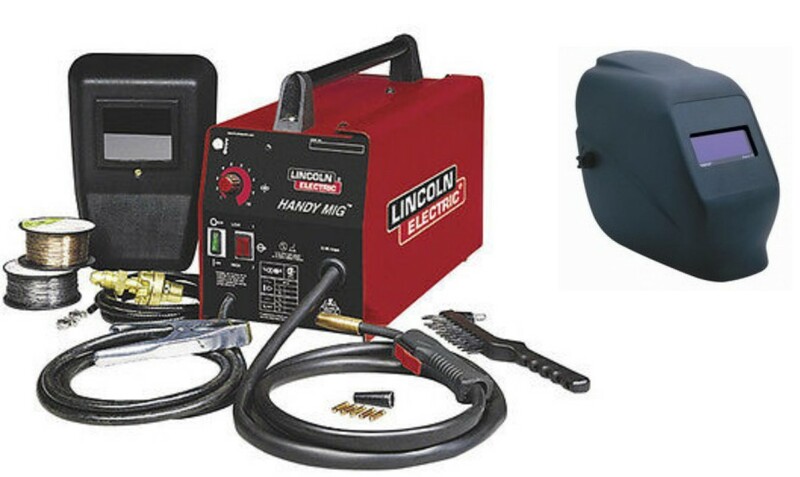 The Lincoln Electric K2185-1 Handy MIG is a compact, portable and lightweight wire feed welder that plugs into a 115V, 20 amp outlet. Four voltage settings and continuous wire feed speed adjustment allow it to weld mild steel from 24 gauge to 1/8in. thick. And, it's easy to get started since practically everything you'll need to MIG weld is in the box gun and cable assembly, work cable and clamp, gas nozzle, gas regulator and hose, spool of solid wire, contact tips and handshield with filter plate and lens. Just add a cylinder of shielding gas. Also included is a spool of self-shielded, flux-cored wire, contact tips, and chipping hammer/brush so you can use your Handy MIG to weld with gasless, flux-cored wire too. Welds both MIG (shielding gas sold separately) and flux-cored. Plugs into household 115V, 20 amp outlet. Cold contactor safety feature keeps welding wire electrically cold until MIGgun trigger is pressed. Continuous wire feed speed adjustment and selectable voltage ranges for precise control.